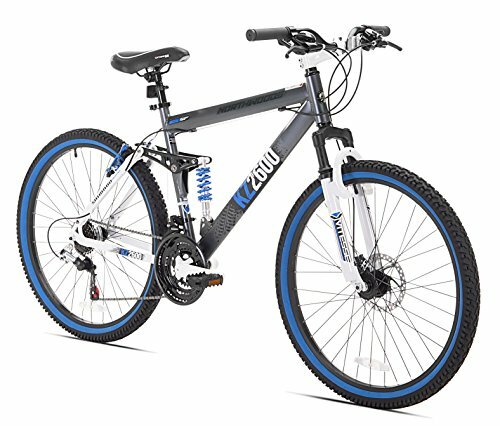 If you are searching for the best dual suspension mountain bike, Kent Thruster kz2600 dual-suspension mountain bike review will help you to choose the best. You can find but you don't have the fortune to spend on it. If you are purchasing the bike for a young rider, the decision becomes even harder. Not only do their interests change rapidly but so does their size. You want a mountain bike that isn't going to leave you in debt years after the bike is left to gather dust in a garage corner or your "smallish" teen becomes a hulking football player. The KZ2600 was designed to make the experience of mountain bike riding exciting. Its tough construction is meant to withstand the bumpy trails. The dual suspension offers a smooth ride that keeps your backside free of bruising, the 21 gears offer enough variety to help navigate obstacles quickly and the tires are small enough to allow you to do all this quickly. You could use this bike for a leisurely run across town but it is an adventure bike, meant for traversing the back roads This mountain bike was created for the explorer whose imagination seeks adventure off the beaten path. The aluminum frame and wheel-set help this forty pound bike remain light enough to handle easily yet make it sturdy enough to withstand the strain of riding on rough terrain. They also leave room to add dual suspension that is often available on more expensive models. When you add in the 21 gears are managed with a trigger rather than the knob on most bikes in this price range. The manufacturer's goal was to create a good looking bike that was strong enough to last. They opted for a 19" frame and 26" tires to offer the most versatility in regards to rider gender and size. The front disc brakes and back linear ones make stopping quickly possible, even on wet or muddy ground. The Kent Thruster is truly a bike that offers it all - versatility, long-lasting quality, and safety. Full (or dual) suspension offers a much smoother ride on uneven terrain. You can ride for longer periods of time and don't feel all the bumps that come from running over things like twigs and small stones. The back suspension is adjustable to help customize the ride to what fits your comfort level best. Disc brakes offer the highest amount of safety. They are designed to stop quickly regardless of the condition of the terrain. This makes it possible to avoid possible ﻿accidents that come from a delayed reaction in stopping. The more speed you have available, the less you find yourself having to slow down in order to adjust for such things as a change in terrain, inclines or going downhill. Most bikes in this price range not only offer fewer gears but also only offer a twist shift. The trigger-style Shimano shifter on the KZ2600 make changing gears quick and easy, allowing for a smooth transition and less distraction. Aluminum allows the bike to be lighter in weight, making it able to move faster and easier to handle. The aluminum is also strong, allowing for a long-lasting frame that doesn't bend at the slightest bump. >> Are you looking for a mountain bike that is specially designed for women? You can read full review of kent thruster excalibur womens mountain bike review too. Twenty-one gears, controlled by a trigger switch, for quick adjustments and smoother navigation. Dual suspension for a smooth ride that allows running over small sticks and stones without ending up with a sore bottom or frustration from many slow downs. Quick stop disc brakes on the front for quicker stopping on wet pavement or muddy ground. 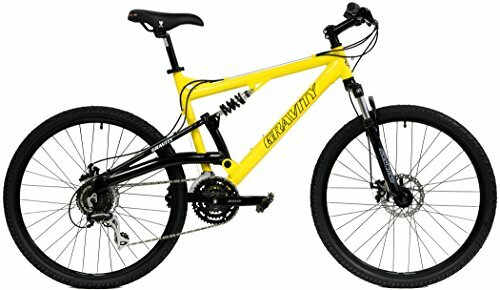 Is this bike good for jumping? 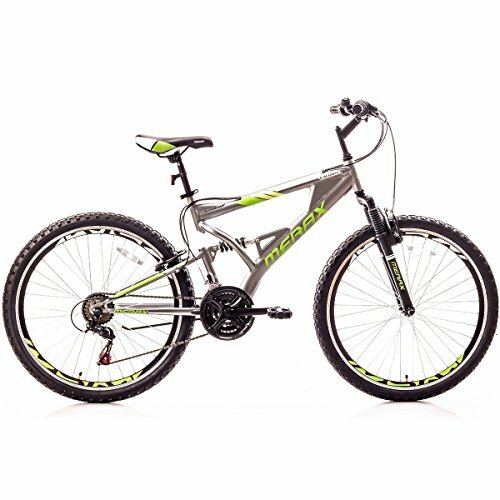 Would this mountain bike be practical for young teenagers? Definitely! It is a bike that will allow for many years of hard riding and growing. Riders as small as 5'2" and 120 pounds have found the KZ2600 comfortable and so have riders 6'2" tall and 250 pounds. The back shocks are adjustable but the front ones are not. The majority of reviewers did not find this to be an issue as the preset levels worked wonderfully. If you are looking for the best mountain bike you can't go wrong by taking a look at the kent thruster kz2600 dual-suspension mountain bike. It is an excellent bike for those who want a bike that will grow with you, both in size and skill level. It is easily upgraded and accommodates body sizes from 5'2" to 6'3" and weights up to 250 pounds. Let's starting mountain biking now! The dual suspension makes it ideal for rugged mountain trails or dirt paths and the 21 speeds are controlled by a trigger switch, making it easy to adjust to changes quickly, preventing unnecessary stops for most obstacles you might encounter on your travels.